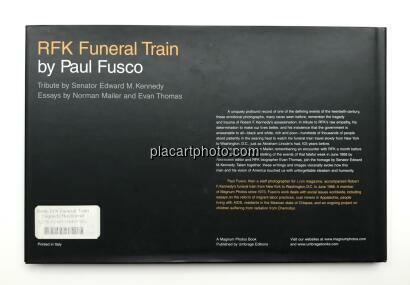 Comments: Hardcover under dust jacket, 190 x 290 mm. Edition, 2000. Text in english. Included in The Photobook by Parr & Badger, vol. 2, p. 46-47. In very good condition. 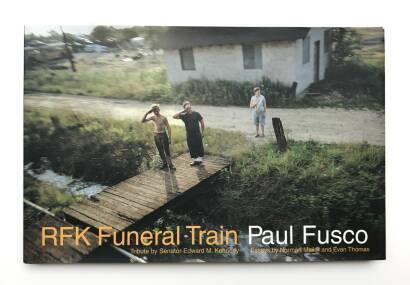 Copy signed by Paul Fusco. Collectible. 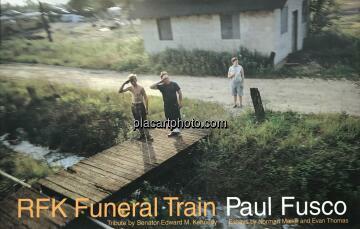 A uniquely profound record of one of the defining events of the twentieth-century, these emotional photographs, many never seen before, remember the tragedy and trauma of Robert F. Kennedy's assassination. In tribute to RFK's raw empathy, this determination to make our lives better, and his insistence that the government is answerable to all - black and white, rich and poor - hundreds of thousands of people stood patiently in the searing heat to watch his funeral train travel slowly from New York to Washington, D.C., just as Abraham Lincoln's had, 103 years before. An essay by Norman Mailer, remembering an encounter with RFK a month before the shooting, as well as a retelling of the events of that fateful week in June 1968 by Newsweek editor and RFK biographer Evan Thomas, join the homage by Senator Edward M.Kennedy. Taken together, these writings and images viscerally evoke how this man and his vision of America toucheds us with unforgettable idealism and humanity.